The bell rings, the crowd roars and the two fighters advance towards one another. The punches are thrown with power and speed. The silver screen action in the ring is non-stop. These are usual scenes that you would expect from any movie about fighting. 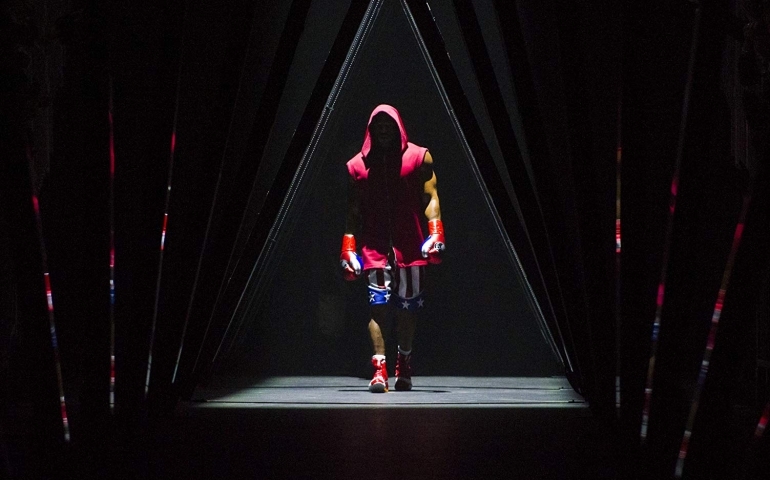 If you’re headed to the theater to experience Creed II, you can expect the same style of excitement. Creed II is the follow-up to award-winning Creed, which came out in 2015. Once again Michael B. Jordan reprises his role of Adonis Creed, the son of Apollo Creed from the original Rocky franchise that this series was born. Fellow co-star Sylvester Stallone once again portrays Rocky Balboa, which earned him a Golden Globe for his performance in the original Creed. Creed II is directed by Steven Caple Jr. who also directed, The Land in 2016. He is a young director that did not disappoint in this film. Although this is the first movie in this franchise that Caple Jr. has directed, it is packed with the tremendous amounts of action that you would expect from this franchise. After seeing this great film, I’m eager to watch other Caple Jr.-directed projects. The Rocky franchise began in 1976 and has had six films before the Creed spinoff in 2015. Now, three years later, Creed II hits the theaters and picks up where the first movie left off. The young Creed is now a seasoned boxer and proving that he is a force in which to be reckoned with. However, he isn’t the only contender awaiting an opportunity. In this film, Balboa is continuing to coach Creed up through the boxing ranks to eventually earn a coveted title shot. This movie re-introduces a past foe of Rocky Balboa, named Ivan Drago, who is once again played by Dolph Lundgren. Drago is now training a young contender, who is a monster of a man: his son Viktor Drago. Viktor Drago is portrayed by Florian ‘Big Nasty’ Munteanu, who is an actual professional boxer. The film once again pits a Creed against a Drago in the ring, much like what was done in Rocky IV. Both with hatred and pain in their hearts, the two young boxers are brought together to fight for family and pride. What ensues is an action-packed sequel, meant to be seen on the big screen. Creed II gets the blood flowing using great action scenes and a soundtrack that features such artists as Lil Wayne, Nas and Nicki Minaj. A high-quality sound system just adds to the excitement and emotion of this film. SNU Senior Tanner Maskey stated, “After hearing the early release of the soundtrack, I’m excited to see it. I can tell that it’s going to be a very energetic, action-packed movie.” Maskey plans to see the movie in the near future. There is no shortage of interest in seeing this film. Having spoken to multiple SNU staff, students and alumni about seeing this film prior to release, the usual response was that they are “planning on seeing the movie.” If you weren’t one of the first to see this film on opening weekend, grab a friend and head out to see it. If you’re a Rocky or Creed fan, it’s a must-see; you will not be disappointed. Action-Packed Adonis Creed boxing Creed Lil Wayne Nas Nicki Minaj Rocky Rocky Balboa Steven Caple Jr.
Prev Post“Toy Story 4”: Do We Need More?